The patio at Tiburon Wines, with a view of the wine wall inside. Photo from Facebook. Terroir Wine Bar, where the Califermentation event will be held. Photo via Facebook. Some quick wine tasting notes for you. First up, ~TIBURON WINE~ is continuing their chef pop-up dinner series on Monday November 7th, with chef Ron Siegel (currently The Western Room at Rancho Nicasio, formerly Dining Room at SF Ritz-Carlton and Michael Mina). There will be five savory courses plus dessert, Champagne and wine pairings, and in case you love something you drink (highly possible), there will be a discount on the featured dinner wines. 7pm. $150 per person, including tax and gratuity. Details on how to reserve and more here. 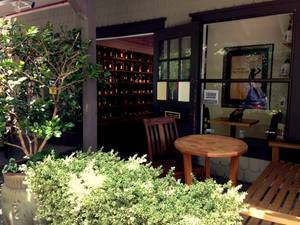 Tiburon Wine, 84 Main St., Historical Ark Row, Downtown Tiburon, 415-497-7693. Califermentation 2016 is back November 12th-13th, and in case you aren’t familiar with it, it’s the first natural wine fair focused exclusively on California wines. There will be morning seminars, tastings (with 48 wineries participating), and more. Most of Saturday’s producers are from Southern California, the Central Coast, and the Sierra Foothills, while those pouring on Sunday have wines from Mendocino, Sonoma, and Napa counties. 12pm-4pm daily. Tickets are $45 per day or $80 for both days. Ten percent of the net proceeds benefit the San Francisco Food Bank. 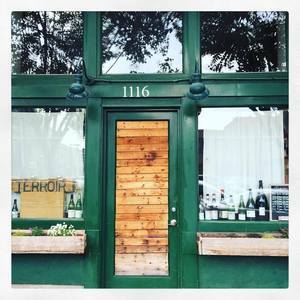 Terroir Natural Wine Merchant, 1116 Folsom St. at 7th St.
Oh, and fans of Donato Scotti’s Donato Enoteca (Redwood City) and Desco (Oakland) should get ready for the opening of ~CRU WINE BAR, MERCHANT &AMP; CAFÉ~ in Redwood City in early November, with partner Eric Lecours. Look for artisan, small-production wines (by the glass, bottle) as well as high-profile selections. A European-style café menu will include charcuterie, Roman-style pizza by the slice, and snacks (including salumi off the 1971 restored and hand-cranked Berkel slicer), as well as beers on draft and specialty coffee from Giamaica Caffè in Verona and specifically imported for Cru (so good, have you had it?). It will open for café service at 8am, lunch at 11am, and there will also be a daily aperitivo/happy hour from 3pm-6pm, sure to be popular on the enclosed patio. 900 Middlefield Road, in the Box building at Jefferson Avenue, Redwood City, 650-362-3535.